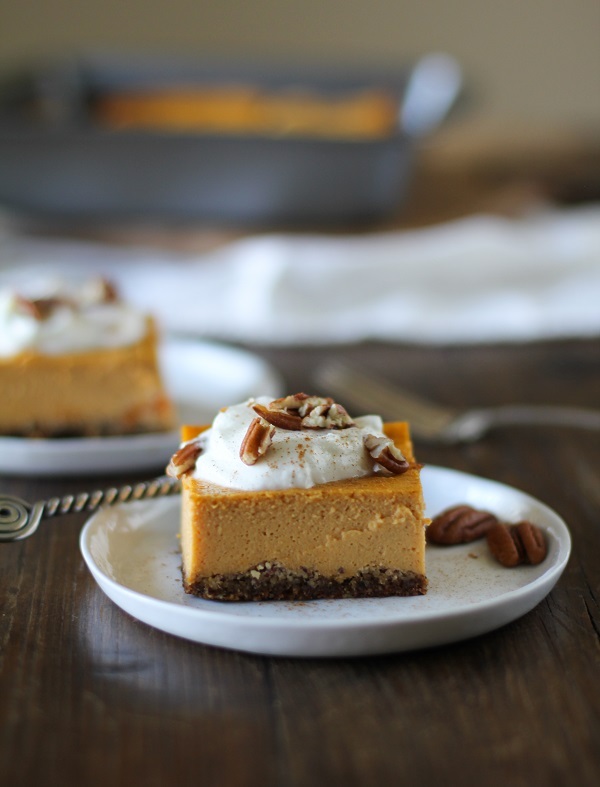 We took this beautiful pumpkin cheesecake recipe from an awesome Shape Magazine article and made it over Attracting Wellness style. This is a delicious recipe and a wonderfully yummy treat for the season. The fresh and delicious pumpkin squash combined with the richness of maple combines for a sweet and delicious treat. Preheat oven to 350 degrees F. Spray a 8” round, or 8” square baking pan with non stick spray. Next take all the crust ingredients in a bowl. Stir until distributed. Pour the crust mix into pan. Next press it bottom and side of dish with your hands. Bake crust for 8 minutes, until golden edges form. Remove and cool. In blender add all ingredients for cheesecake. Blend until even. Pour the cheesecake filling into the pan with the crust. Bake for 40 to 50 minutes, until center firms. It shouldn’t jiggle when you shake the pan. Cool for 30 minutes, then chill for 2 hours allowing to firm up. Goes well served with plain greek yogurt, drizzled with maple, whipped coconut cream, and or nuts.